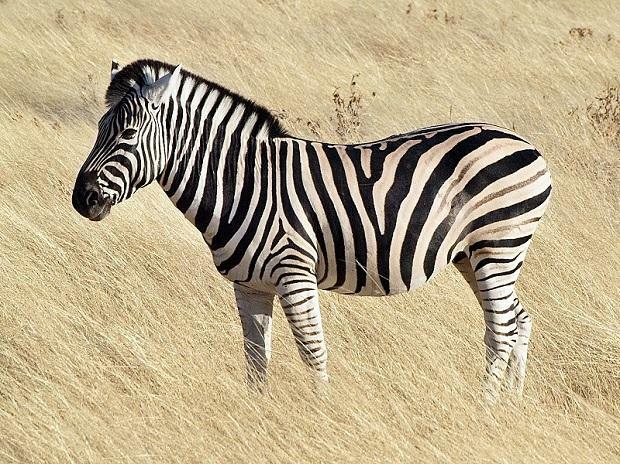 Could stripes help zebras avoid becoming a predator’s meal? There are many problems with this idea. Field experiments show that zebras stand out to the human eye when they’re among trees or in grassland even when illumination is poor – they appear far from camouflaged. And when fleeing from danger, zebras do not behave in ways to maximize any confusion possibly caused by striping, making hypothetical ideas about dazzling predators untenable. Most damaging, zebras are a preferred prey item for lions – in study after study across Africa, lions kill them more than might be expected from their numerical abundance. So stripes cannot be a very effective anti-predator defense against this important carnivore. So much for the evading-predators hypothesis. What about the idea that stripes help zebras engage with members of their own species? Every zebra has a unique pattern of striping. Could it be useful in individual recognition? This possibility seems highly unlikely given that uniformly colored domestic horses can recognize other individuals by sight and sound. Striped members of the horse family do not groom each other – a form of social bonding – more than unstriped equid species either. And very unusual unstriped individual zebras are not shunned by group members, and they breed successfully. Again, this seems improbable: Careful experiments in which large water barrels were draped in striped or uniform colored pelts, or were painted striped or unstriped, showed no differences in internal water temperatures. Moreover thermographic measurements of zebra, impala, buffalo and giraffe in the wild show that zebras are no cooler than these other species with whom they live. The last idea for striping sounds preposterous at first blush – stripes stop biting insects from obtaining a blood meal – but it has a lot of support. We think that the reason equids need to be striped in Africa is that African biting flies carry diseases such as trypanosomiasis, African horse sickness and equine influenza which can be fatal to equids. And zebras are particularly susceptible to probing by biting fly mouthparts because of their short cropped coats. Having a fur pattern that helped evade flies and the deadly diseases they carried would be a strong advantage, meaning stripes would be passed on to future generations. But how do stripes actually exert their influence on biting flies? We set out to examine this at a livery in Somerset, U. K., where horseflies collect in the summer. It is important to remember that flies have much poorer vision than people. We found that zebras and horses received a similar number of approaches from horseflies, probably attracted by their smell – but zebras experienced far fewer landings. Around horses, flies hover, spiral and turn before touching down again and again. In contrast, around zebras flies either flew right past them or made a single quick landing and flew off again.